I generally like Gamespot, they’re a cool and informative site with good indepth reviews and loads of goodies. I generally like Electronic Arts as well, they’ve been responsible for some damn good games on various platforms (though I don’t do sports games.) But they’re currently teaming up in a sleazy marketing gimmick of which I highly disapprove. When visiting Gamespot, a surfer is frequently greeted with a large advertisement that displays for about 15 seconds before redirecting to the real Gamespot homepage. The site sets a short-lived cookie to ensure that you don’t see the ad on subsequent visits, so that’s considerate of them at least. But one of these splash-page ads in current rotation is a full-screen image of the Gamespot homepage, filled with advertisements for EA Sports titles. 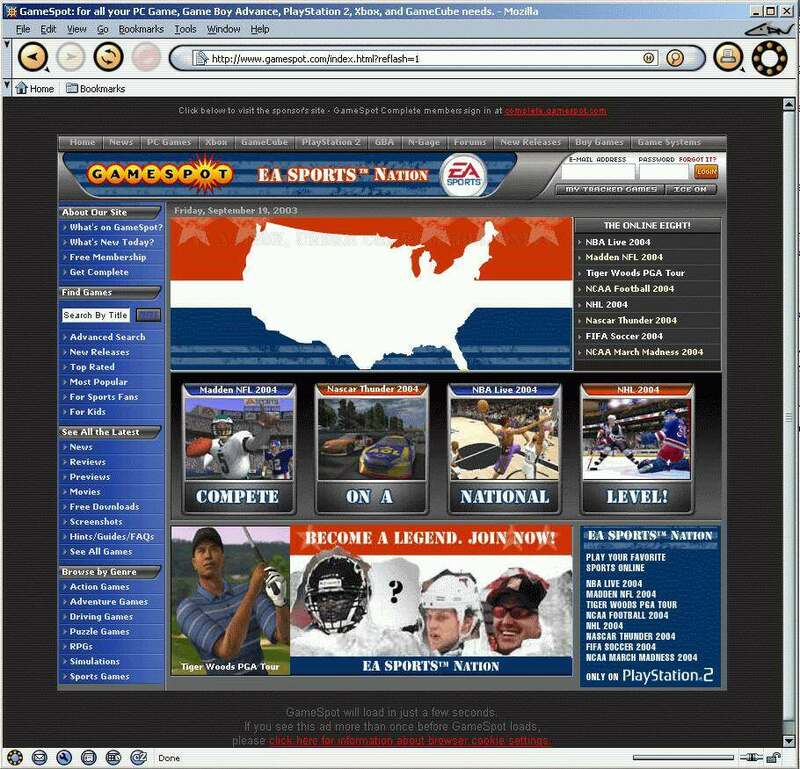 The Gamespot graphics, navigation and layout are all faithfully recreated, along with their logo. Clicking anywhere in this ad sends you to the sponsor’s site, even when you thought you were clicking a menu item to find the latest Silent Hill 3 screenshots. While there is a disclaimer stating that the page is an advertisement and that clicking it will whisk you off to the sponsor site, the disclaimer text is easy to miss, especially when you think you’re seeing the real website and are thus not looking for an ad disclaimer. This is deliberately deceptive advertising, designed with the express intent of tricking people into visiting a site they did not neccessarily wish to visit. And since I’m sure Gamespot gains revenue based on the number of clickthroughs (and since they’re allowing the use of their copyrighted design and logo in the ad) they’re obviously an active and willing participant in the deception. Such trickery is unethical to say the least, and could even be borderline illegal, along the lines of the fake Windows alert banners which have already landed more than one company in legal trouble. It’s smarmy clickthrough-phishing and Gamespot and EA should both be ashamed. This was posted on Wednesday, October 29th, 2003 at 9:23 am	and is filed under Rant. Comments closed, no pings allowed.